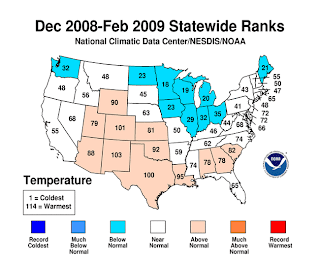 NOAA's National Climatic Data Center announced today preliminary data for the 3 months of meteorological winter, December 2008 to February 2009. For the country as whole, the U.S. averaged about half a degree above the long-term "normal". Temperatures were warmer than average across much of the South and the central Rockies, while cooler temperatures were mainly limited to the Great Lakes. For the month of February, temperatures were near to above normal over nearly the entire country; on a statewide basis, the only exception was Florida. 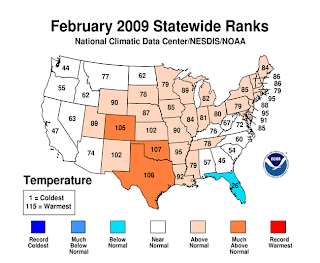 * The December 2008 – February 2009 average temperature was 33.49 degrees F, which is 0.53 degree F above normal. * On a regional basis, temperatures were warmer than average across the southern tier states and central Rockies, while the upper Midwest, Great Lakes, Maine, and Washington had a cooler-than-average winter. * Based on NOAA's Residential Energy Demand Temperature Index, the contiguous U.S. temperature-related energy demand was 0.4 percent above average during winter. Precipitation patterns were generally dry over much of the U.S. For the country as a whole, this was the 5th driest December-February in 114 years of records. 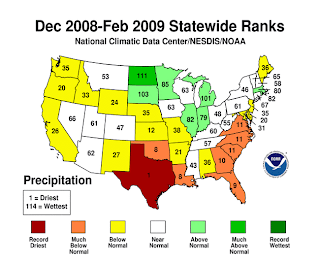 The state of Texas had its driest winter on record, and it was the 10th driest in the Southeast. For the months of January and February, 12 states had their 10th driest, or drier, such 2-month period. These results may be compared with the Climate Prediction Center's winter forecast made in November.